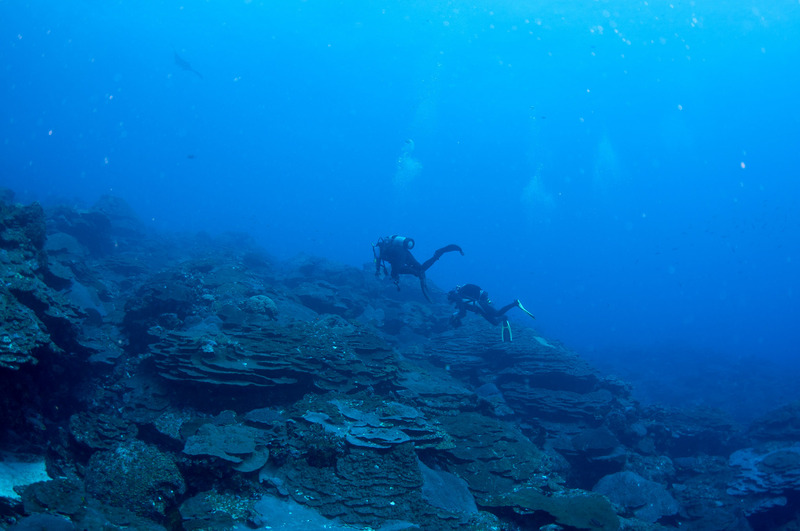 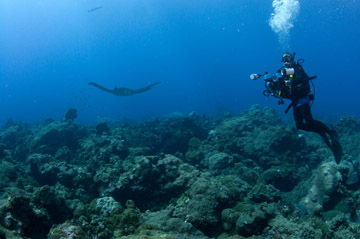 Each year the coral spawning event is greatly anticipated by both researchers and recreational divers. 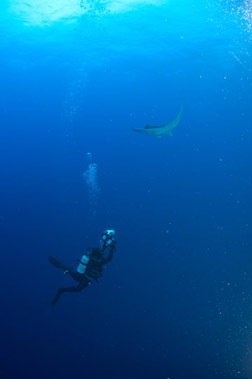 This year's event was characterized as one of the best our researchers have ever seen. In addition to documenting	the	timing	of	different	spawning	corals,	this	trip	was also focused on collecting coral fragments for genetic studies, deploying coral recruitment racks, retrieving and redploying Semi-Permeable Membrane Devices (SPMDs) for oil spill response, collecting sediment and water samples for oil spill response, conducting fish counts, downloading accoustic receiver data, and retagging deep long-term monitoring stations. 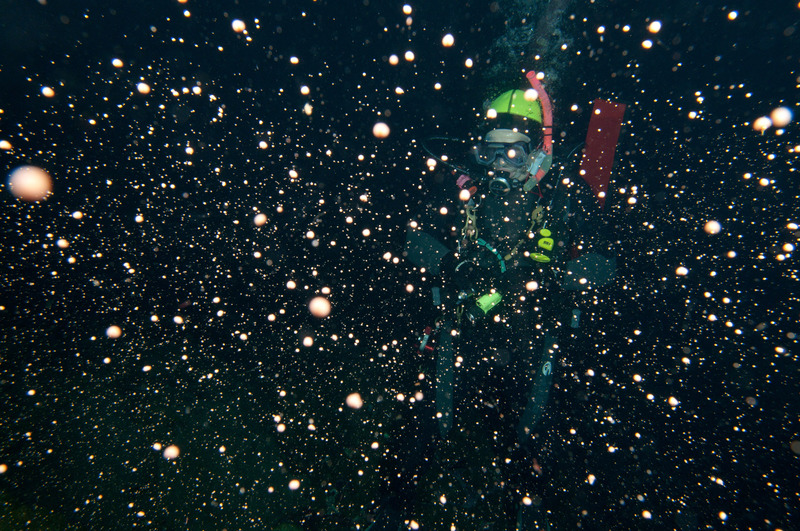 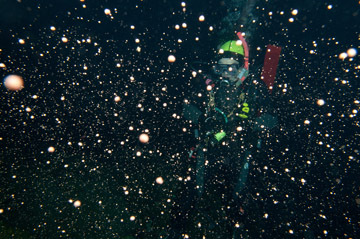 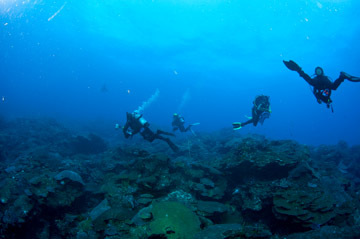 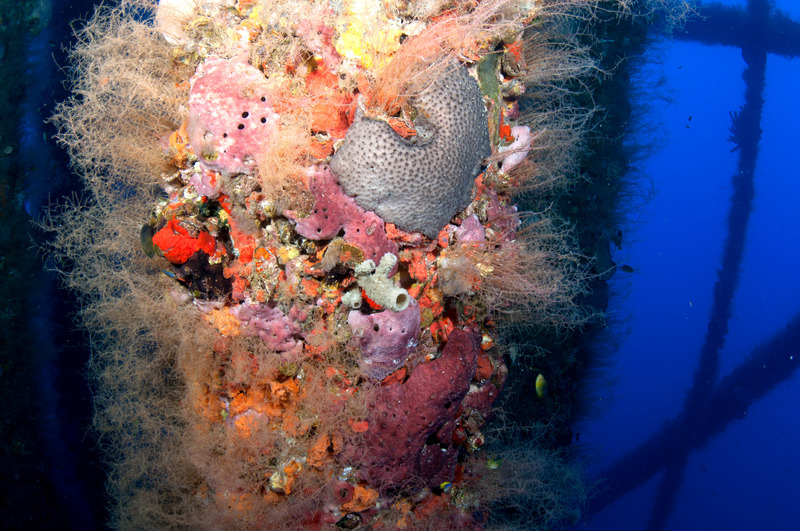 The M/V Spree was also on site for the coral spawning with a boatload of recreational divers. Dan Basta recording temperature and salinity profies. 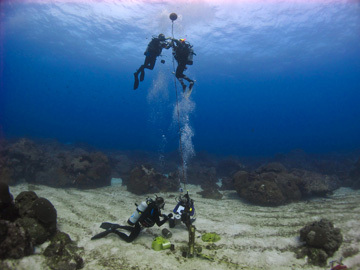 Researchers spent part of their daylight hours replacing missing or damaged tags for repetitive photo stations in a deeper area of East Flower Garden Bank. They also photographed all of the stations. 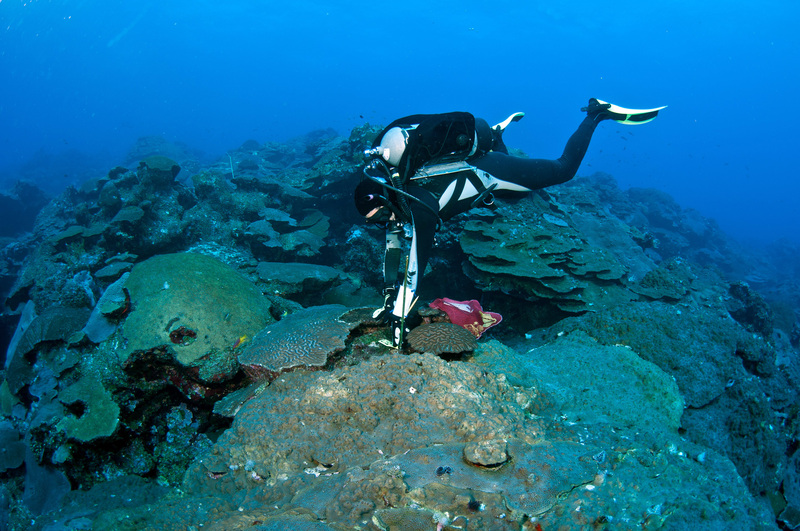 Marissa Nuttal retags a deep station at East Flower Garden Bank. 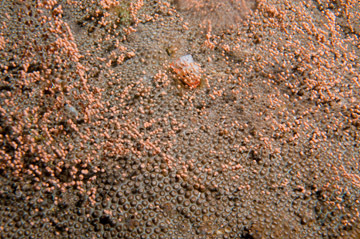 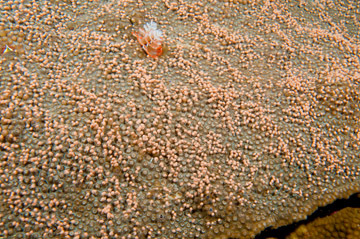 Coral cover in this area reaches about 70 percent! 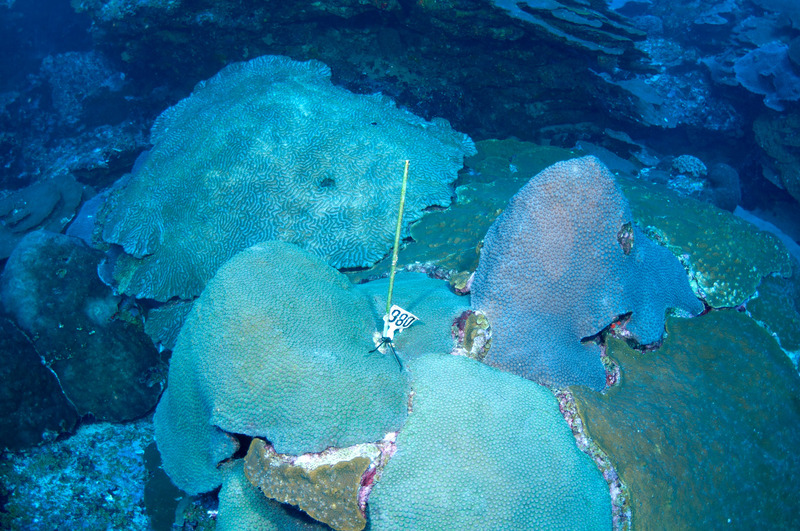 Researchers replaced number tags on several deep monitoring stations on the east flank of East Flower Garden Bank. Photo: Schmahl/FGBNMS. 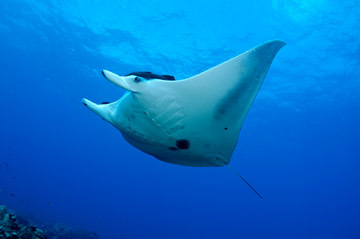 Several manta rays were photographed on this trip and added to the manta catalog. 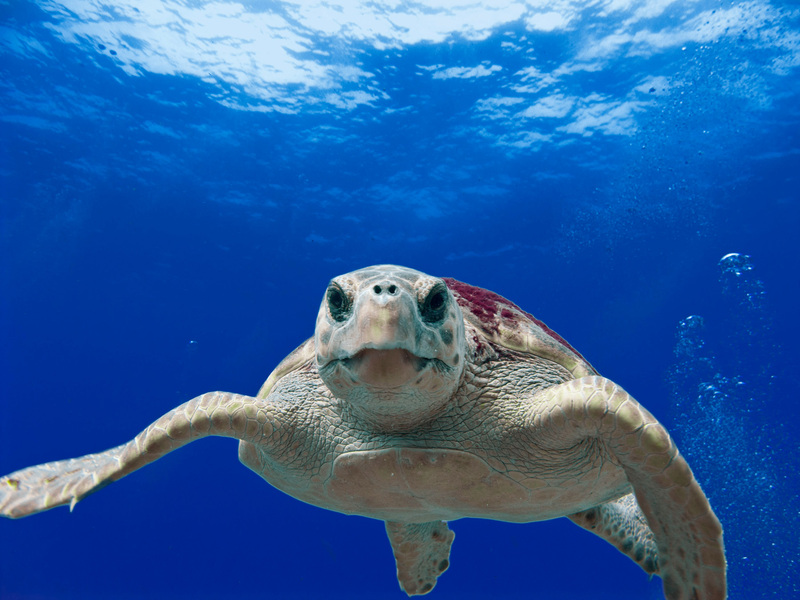 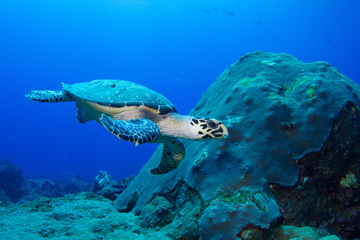 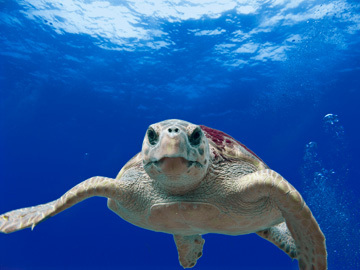 Divers also encountered two different sea turtles while working. 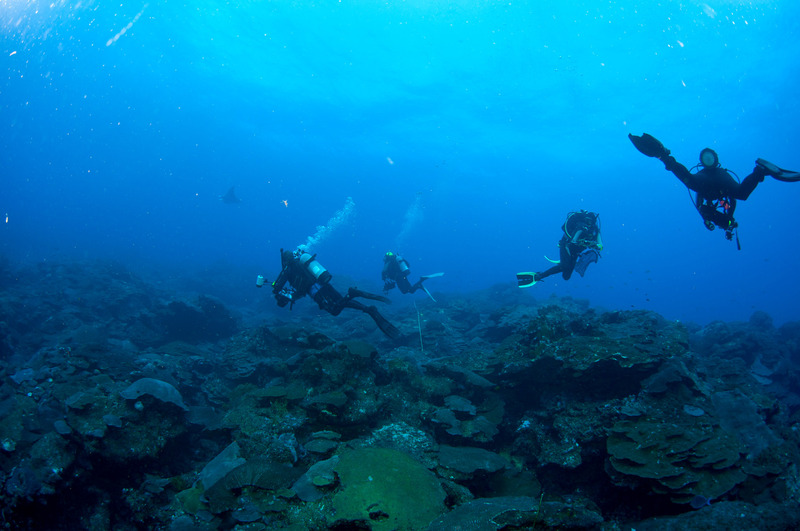 Divers also retrieved and replaced the Semi-permeable Membrane Devices (SPMDs) at East and West Flower Garden Banks, and collected sediment samples. 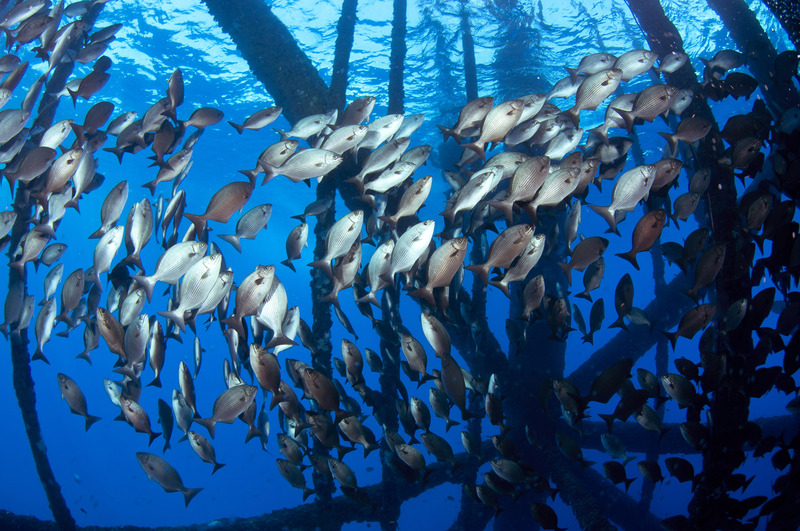 This is part of ongoing Natural Resource Damage Assessment (NRDA) in response to the Deepwater Horizon Oil Spill. 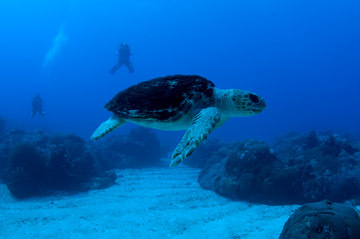 Tom Moore, Dan Basta, G.P. 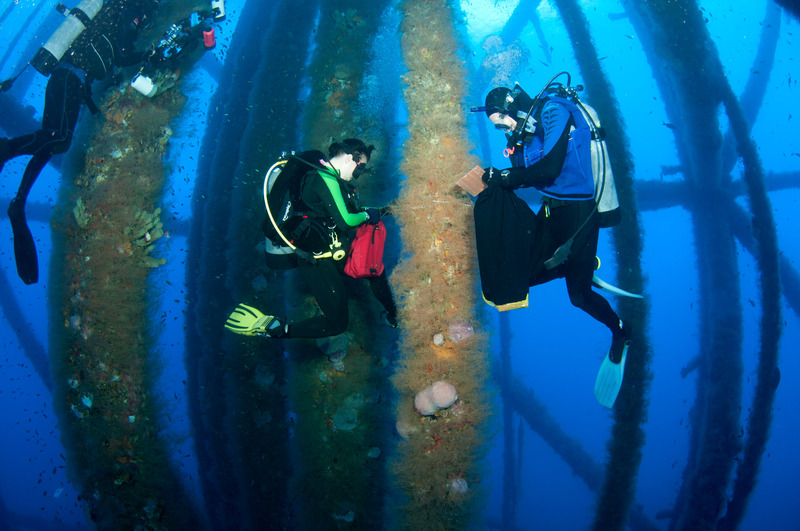 Schmahl and Emma Hickerson deploy SPMDs at East Flower Garden Bank. 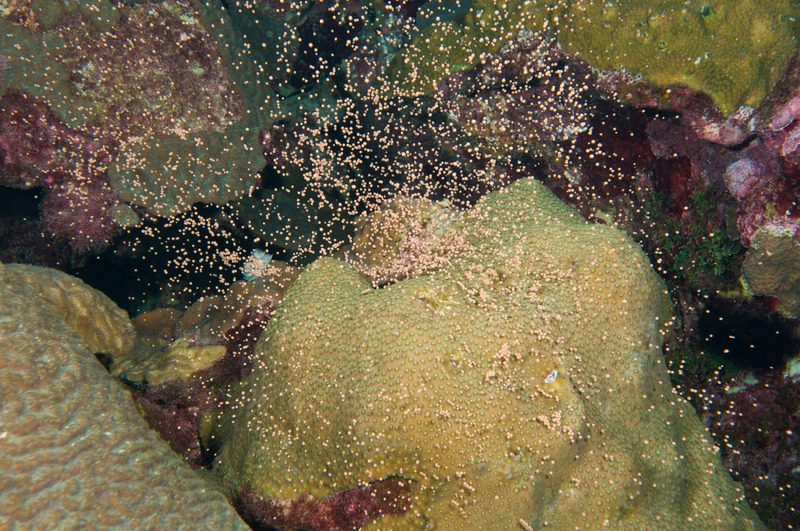 Sanctuary researchers were able to observe the coral spawning activities on the 7th and 8th nights after the full moon (August 30 & 31). 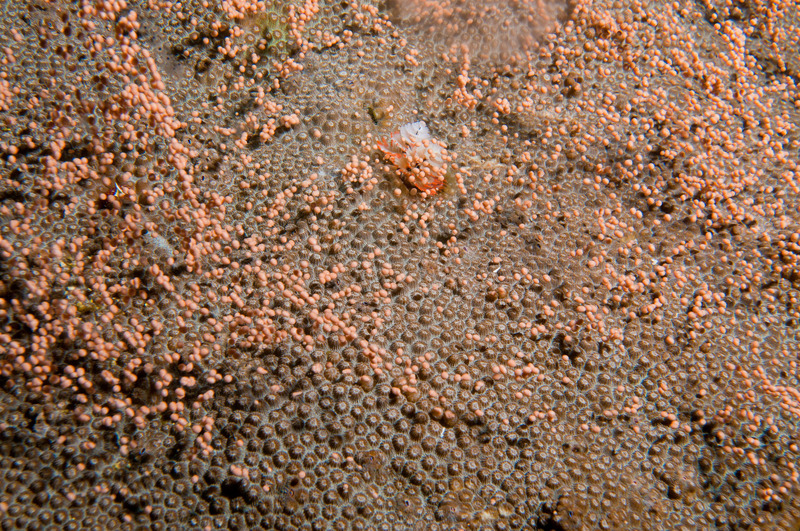 Everyone reported that the release of gamete bundles (egg and sperm packets) was spectacular. 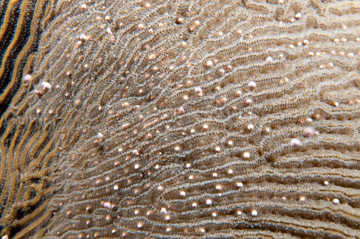 Orbicella (Montastraea) franksi, a star coral, with gamete bundles "set" in the coral polyps' mouths just before they are released. 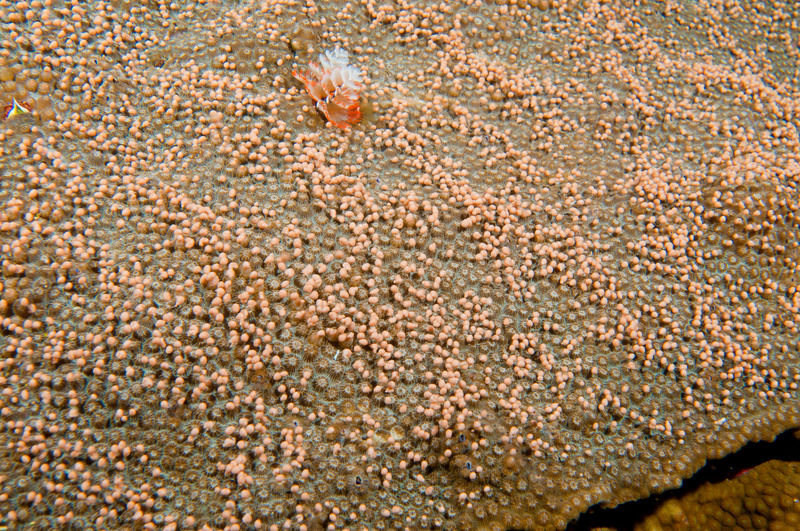 The ruby brittle star (Ophioderma rubicundum) is probably waiting to catch some of the bundles for food. 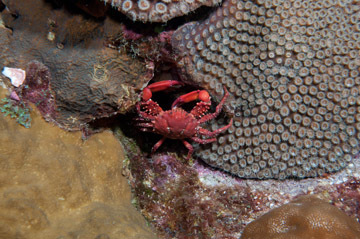 Of course, other animals are also out and about on the reef at night. 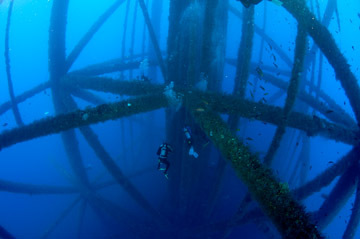 Part of the expedition included a visit to High Island A-389A, the only oil and gas production platform inside sanctuary boundaries. 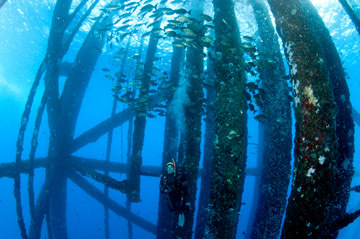 This platform is located about one mile from the coral cap at East Flower Garden Bank. 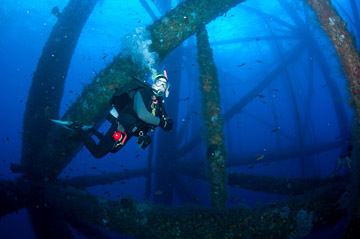 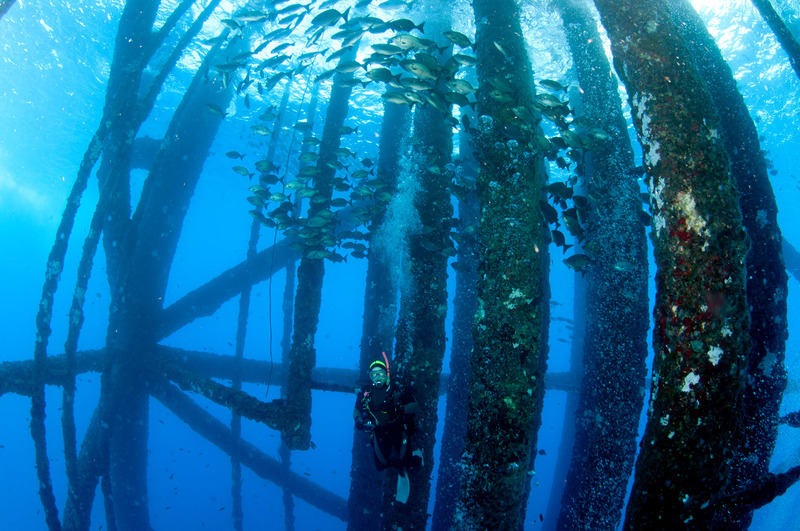 Oil and gas production platforms are popular dive sites in the Gulf of Mexico. This one, HI-A-389A, lies within sanctuary boundaries at East Flower Garden Bank. 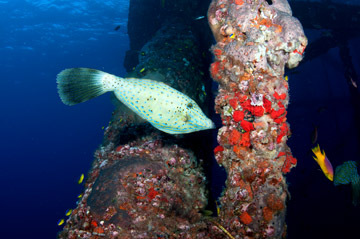 Scrawled filefish (Aluterus scriptus) are common residents around the artificial reefs on platforms. 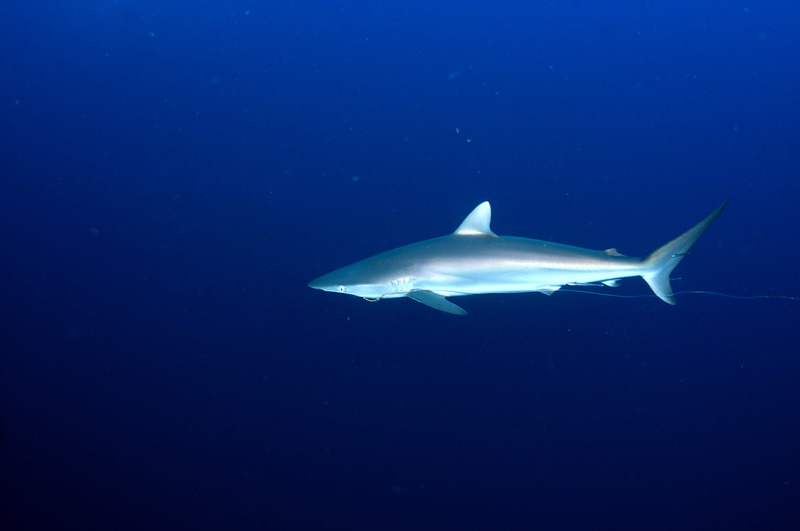 This silky shark swimming outside the platform structure had a hook and leader line trailing from its mouth. This manta hung around the divers for their entire dive at HIA389A.